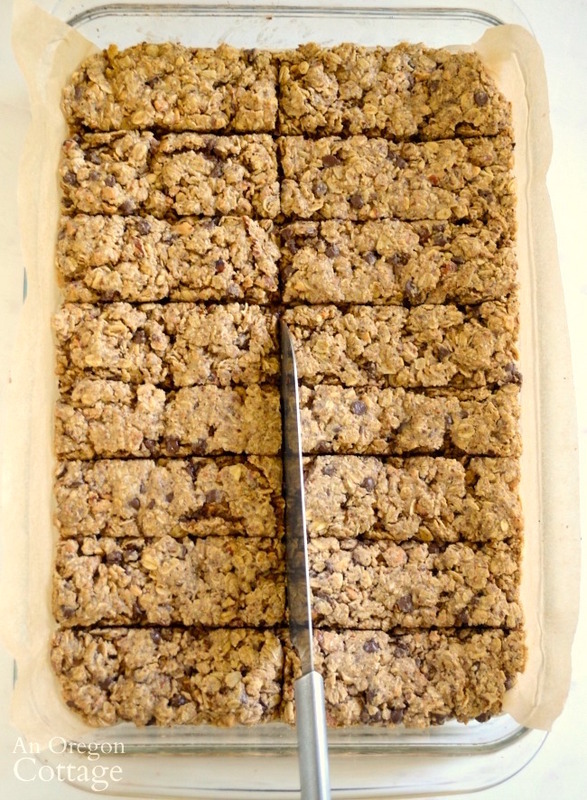 Need an easy recipe for homemade baked chewy granola bars that don’t fall apart and stay moist? Here it is- a recipe that takes just minutes and is healthier and tastier than anything you can buy! Granola bars. The store shelves are FULL of so many different kinds. There are the bars we all knew from years ago – the crispy flat bars that came two to a package. Then the barrage of chewy granola bars hit the shelves which seemed to up the sugar content – some are so close to a candy bar that they are coated in chocolate! Even so, the term “granola bar” still has a healthy association, doesn’t it? And now of course you can find a whole section of “healthy” bars that may be all nuts, all grain, only sweetened with dates, and so on. Though most still have long ingredient lists, questionable flavors, and are really expensive ($4 for one bar!?). But granola bars are still one of the best ways to have a quality on-the-go snack or meal replacement, especially when you can control the ingredients. 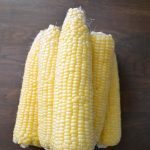 So I began a quest to create a recipe that would stay moist and chewy, but not fall apart. After trying what seemed like a million granola bar recipes, I came up with not one, but two that were just about perfect. 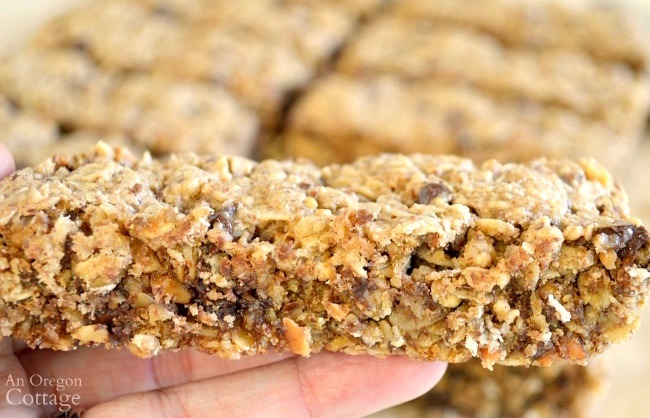 A quick chewy no-bake granola bar and this hearty baked chewy granola bar. Why two granola bar recipes? I like to make this baked bar when I want a nutritionally dense, hearty bar that’s great to take hiking and camping. It’s also the one I make when I don’t have crispy rice cereal and granola to make the chewy no-bake bars. When I do have the ingredients and need a quick bar, it’s great to have the no-bake option. 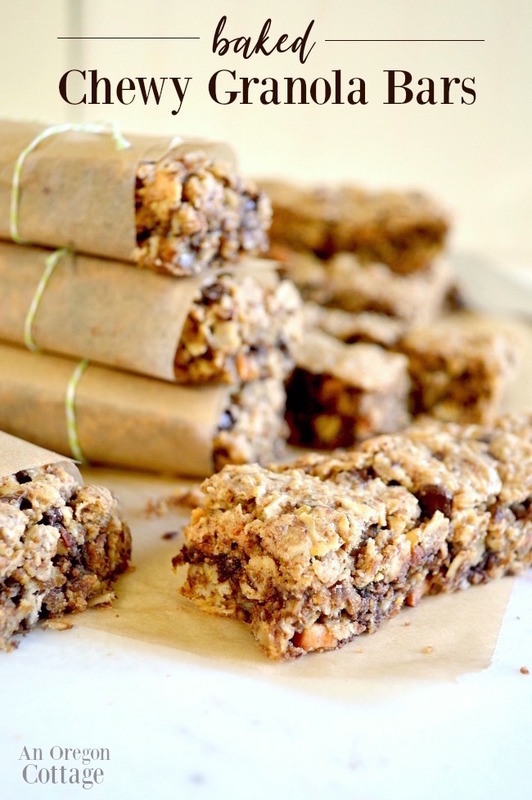 Which isn’t to say these baked bars are a second choice option – we LOVE them! They are just sweet enough (using either honey or maple syrup), have great flavor, and are full of possible variations. I feel great feeding these to my family! Even though they are baked, they are still chewy and these bars seem to stay fresher longer at room temperature than the no-bake variety, a plus for vacations. But they do take a little bit longer to make, so I find myself going to the no-bake variety if I have all the ingredients and limited time. All this is to say – I like having two go-to recipes for granola bars where I know the ingredients and can change them up with different flavors and add-ins. I hope you’ll try both and let me know if you also like the versatility of having two recipes! 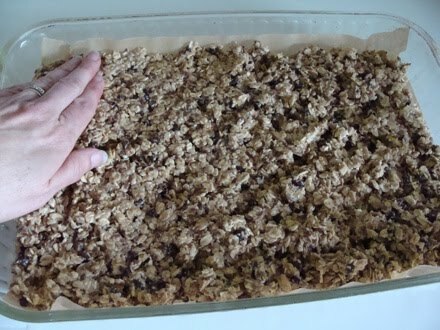 Wondering how easy it is to make your own baked granola bars? 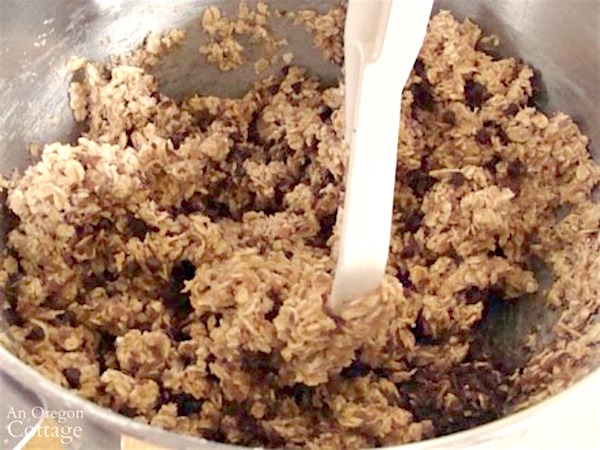 About as easy as mixing together a batch of bar cookies! 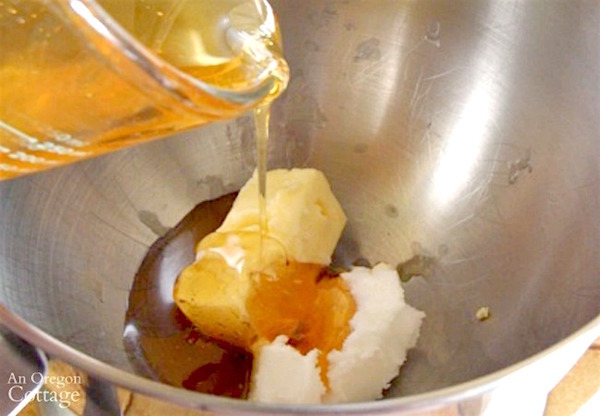 Start by creaming butter, coconut oil, honey, and vanilla. Add the remaining ingredients and mix to combine. You can choose your ingredients to equal 1 cup of add-ins. When I use chocolate chips, I decrease it to just 1/3 cup and use mini chocolate chips – 1/2 cup just seemed too much. I list some of our favorite combos in the full recipe. Pat into a parchment-lined (or greased) baking pan and bake for about 20 minutes, until just browning around the edges. Cool about 10 minutes on a rack before scoring into bars while in the pan and then let them cool completely. 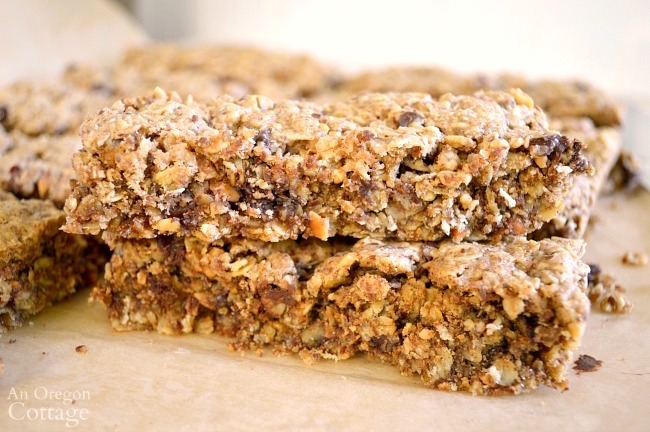 I like to cut these into long bars to resemble granola bars, either 16 or 20, but they are pretty big – and nutritionally dense – so you may want to cut them into smaller bars. When my kids were younger, I always wrapped these individually in parchment or in baggies to keep in the snack basket for easy grabbing. 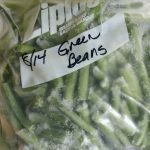 Now I simply keep them in an airtight container in the freezer because we eat them less often and freezing them means they are fresh whenever we want them. I like to grab one to keep in my purse for long days in town running errands and they’re perfect in a backpack for a day of kayaking or hiking. If you’ve got these waiting, there’s never a need for questionable store-bought bars, no matter how “natural” they proclaim to be. It’s so nice knowing exactly what is in what you’re eating, isn’t there? 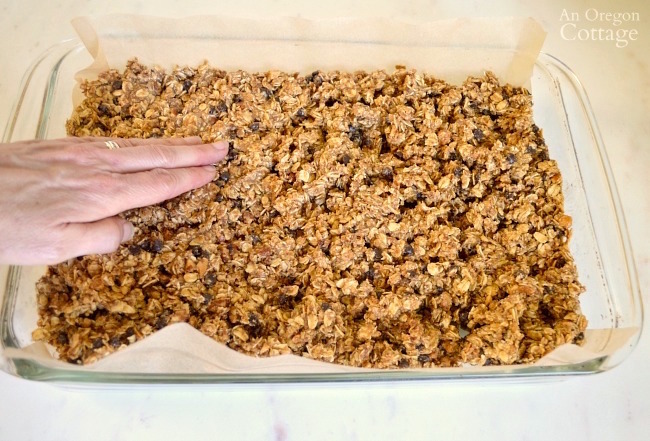 Click the arrow for the full baked chewy granola bars recipe (with print options)! 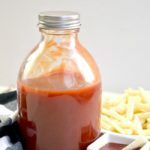 Found your site looking on P for a ketchup recipe. Spent a LOT of extra time researching your other recipes and ideas. I try to stay away from refined oils, sugars and syrups, and any processed ingredients. ANY oil that does not say “EXPELLER PRESSED” will kill you, that simple. I was involved in the production of many types of edible oils in a past life. 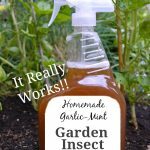 Great ideas and comments, will be trying a number of recipes. Thanks. Glad you are finding recipes you can use, Gary. Thank you SO much! You solved my search for the perfect homemade granola bar! The only problem is that these are too good and we eat them up so fast I had to make another batch a few days later. Thanks again! I’m so glad to know that, Judith – you’re so welcome! 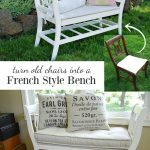 I’ve made these many times and my family loves them! 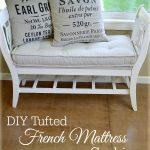 Thanks for sharing and love your site! 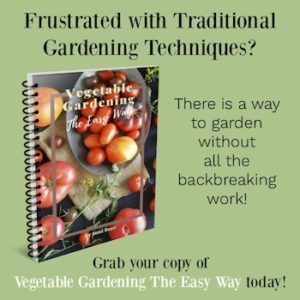 I use it often for recipes. Wow, thanks so much for letting me know, Brittany – your kind words just made my day! Just made these without flax meal, added 1 t. sea salt and my add ins were coconut, flax seeds and chia seeds, YUMMY!! Thanks for sharing! I have a friend asking if the flax meal is necessary?? Is it just for texture, or is it used as an egg substitute?? BTW – I’ve made this several times and my kiddos don’t even wait for it to cool before devouring the whole pan!! No, the flax isn’t needed for anything other than an added health benefit, Amy. I just try to sneak in healthy ingredients where ever I can. 🙂 Glad your family likes them! 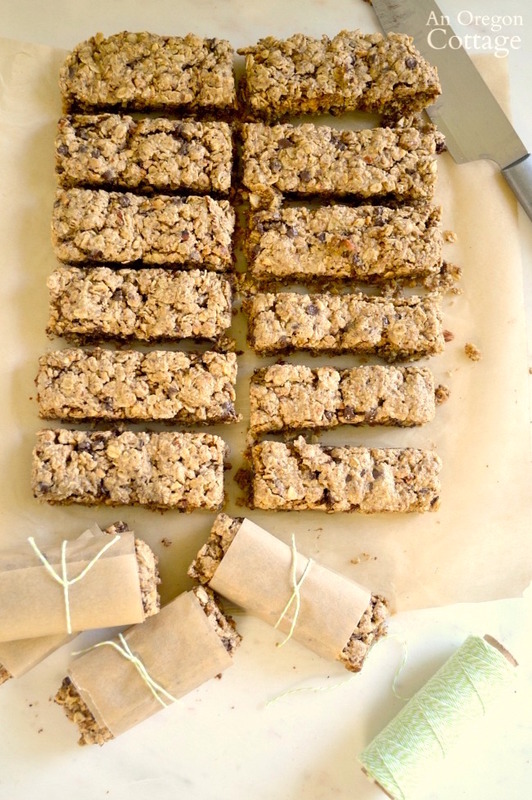 What a great idea to make your own granola bars. I have a severe allergy to sesame and never buy them in the store because I worry that they may contain tiny sesame seeds. I will definitely try your recipe. Thank you for your comment on our kitchen cabinets. Yes, it’s a big difference without those small cabinets on both sides of the window, and we don’t even miss the storage. these look good! I would like to try them because healthy ones are so expensive to buy. Shannon- Yeah, I wish I had found them earlier, too. 🙂 And my kids like the chocolate chip variation best, too, I think! 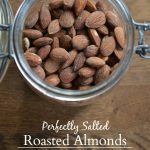 I have a VERY similar recipe that I make (slight changes to ingredient amounts, but same ingredients) and we absolutely LOVE them! I was fortunate to stumble on the recipe early in my quest for “The Perfect Granola Bar”, that I never thought to keep looking for something different. I’ve never thought to make it with maple syrup – now I’m going to have to make a batch tomorrow to give that variation a try! One of our favorite ways to have them is a white chocolate chip/mini chocolate chip combination. They’re a bit more “dessert-y” that way, but sometimes that’s what we’re looking for – a little sweet something without eating a cookie,brownie, or piece of cake. And because I make them frequently enough, it helps keep the super sweet sweets (cookies, etc) out of our house…Lord knows my hips don’t need those! I also love that my kids love them too. They actually request that I make them, and that is music to my ears – that they crave something healthier!! Thanks for the variation ideas, and Happy Cooking! Barb- You sweet thing! Thank you. 🙂 I’ll be waiting to hear how they work for you and your son! 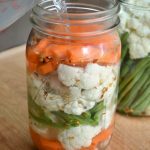 Heather- Let me know which recipe you try and is most similar to the store-bought one you like!